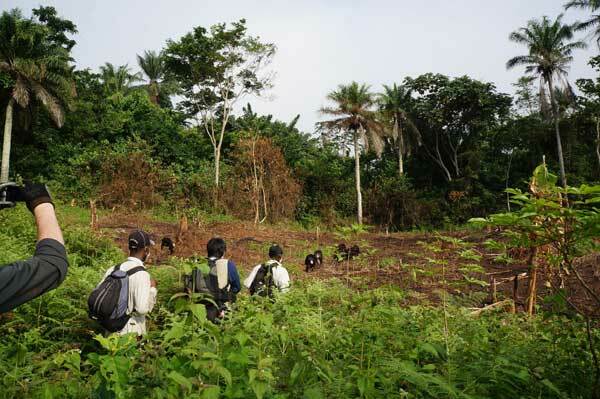 An observational study was conducted on wild chimpanzees between April 16th and June 10th, 2012 at Bossou, Guinea. During this time period I have collected data with help of a GPS tracking device, exploring a total of 249km (361 hrs. ). 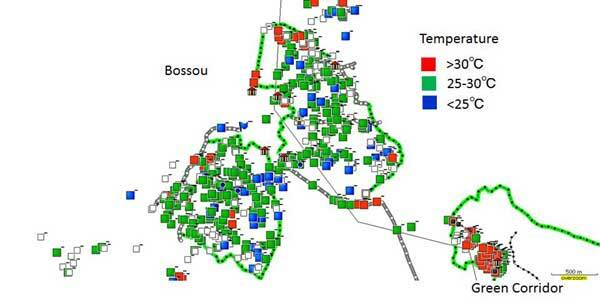 Additionally to the behavioral data collected, I have also measured and recorded temperature and relative humidity at 1636 sites, using a portable temperature/humidity measuring device within the chimpanzee's home range, including the green corridor project area. The results indicate that wild chimpanzees use their habitat by based on available thermal spots. For example, during the morning hours when the temperature was still relatively low but steadily rising, chimpanzees tended to stay on open places with sunlight. In contrast, when the temperature in the afternoon was high, chimpanzees preferred to stay mainly resting in their nests in the shade provided by the forest. From the heat-regulation point of view the green corridor project seems to be an optimal invention as it could provide thermal comfort spots for warming as well as for cooling. When it becomes dry and extremely hot in the afternoon, the plantation's nursery arbors can readily provide shady areas for animals. At present chimpanzees have been using the area with low frequency. Once, however, when expanding the project area using the presently established plantation strategy of natural fruit plants, the project area is expected to be an alternative habitat with fruit and vegetation, plus thermal spots to avoid or obtain heat for chimpanzees at Bossou. Distribution of the average temperature. Chimpanzees walk down the field in the morning.